A Whitehorse man is facing charges following a break-in at the Red Feather Saloon in Dawson City last month. A Whitehorse man is facing charges following a break-in at a historic building in Dawson City, Yukon, last month. Parks Canada says the break-in resulted in more than 100 objects being damaged or destroyed at the Red Feather Saloon. It says some of the items are reproductions and others are originals. All were part of its Klondike National Historic Sites collection. According to an RCMP news release issued Wednesday, police were called to the saloon at about 1 a.m. on Oct. 21. They found a 19-year-old man inside the the building and arrested him. The man is facing charges for break and enter and mischief. He has been released on conditions, with a promise to appear in court in Dawson City on Dec. 11. In an email to CBC News, Parks Canada said bottles, flutes, decanters, and a variety of glasses are among the damaged and destroyed items. It says the total cost to repair or replace the objects, as well as to repair a door and window that were damaged, is $10,000. 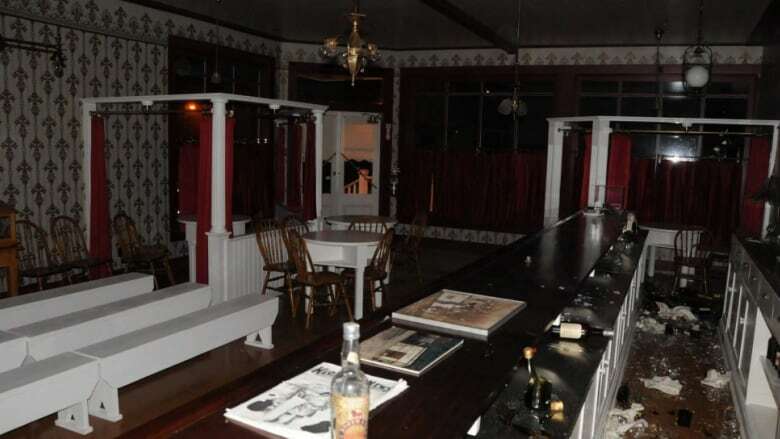 The agency said the Red Feather Saloon is a reproduction of the original bar from 1902. The building is owned by the Yukon government but used by Parks Canada to deliver interpretive programming during the summer season. Visitors can enter the saloon and look at Gold Rush-era saloon artifacts. Parks Canada says it's working with the territory to increase security measures at the building and repair it in time for next year's visitor season.